Figure 3.24. Imposed horizontal takeoff requirement can radically increase takeoff gross weight unless the weight ratio is less than 4.5.
loadings. The horizontal takeoff, horizontal landing (HTOL) solutions for constant wing loading are shown for values of tau from 0.2 to 0.063. The point at which the VTOHL and HTOL modes have the same gross weight is then the maximum weight ratio for which there is no penalty for horizontal takeoff. For example, at a takeoff wing loading of 973 kg/m2 (200 lb/ft2) this weight ratio is 5.5, or an airbreathing speed of Mach 6 ± 0.3. For a takeoff wing loading of 610 kg/m2 (125 lb/ft2) the VTOHL/HTOL boundary is now a weight ratio 4.3, or an airbreathing Mach 10.5 ± 0.5. 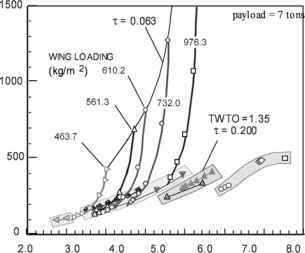 This wing loading is also correct to air launch, horizontal landing (ALHL) in the Mach 0.72 at 35,000 ft region. For a takeoff wing loading of 464kg/m2 (95 lb/ft2) the VTOHL/HTOL boundary is now a weight ratio 3.4, or an airbreathing Mach 13 ± 1.0 or an ACES propulsion system. 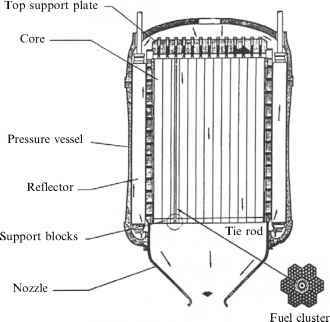 This latter wing loading is the wing loading that would represent the maximum airbreathing speed practicable and consistent with commercial transports. For an airbreathing rocket, a mass ratio of 5.0 is achievable. That results in a gross weight of about 230 tons. This is less than half the 480 tons for an all-rocket case. However, if a horizontal takeoff requirement is imposed a priori, the lowest wing loading for which a practical solution exists is 610.2 kg/m2. At that point, the gross weight for the horizontal takeoff solution is about 800 tons, almost twice the all-rocket value. If the study team is not aware of the comparison to vertical takeoff, the improper conclusion might be drawn that it was the propulsion system that caused the divergent solution. For lower wing loading, the solution curve becomes vertical, and the solution will not converge. The conclusion is that, if the weight ratio is greater than 4.5, the best vehicle configuration is vertical takeoff or an air-launched configuration (all of the vehicles have a horizontal landing mode). Again, it is important to let the characteristics themselves of the converged solution determine the takeoff and landing modes, if the lowest gross weight and smallest size vehicle is the goal.